How dangerous are black widow spider bites? If a black widow spider bites a person, do not panic! No one in the United States has died from a black widow spider bite in over ten years. Very often the black widow will not inject any venom into the bite and no serious symptoms develop. Wash the wound well with soap and water to help prevent infection. If muscle cramps develop, take the patient to the nearest hospital. Some victims, especially young children, may be admitted overnight for observation and treatment. Treatments are available for the symptoms caused by a black widow spider bite. Various medications are used to treat the muscle cramps, spasms and pain caused by a bite. Black widow spider antivenin is seldom necessary. The female black widow spider, though it is the most venomous spider in North America, seldom causes death as it injects a very small amount of poison when it bites. Reports indicate human mortality at well less than 1% from black widow spider bites. If you are bitten by a black widow spider you may experience one or more of the symptoms listed below. Poison injected by the spider at the time of the bite causes the symptoms, not the bite itself. Small children and the elderly are often more symptomatic and can have a more severe reaction to the venom of the black widow spider. If you are not sure if you were bitten by a black widow spider, you should know that the following symptoms can be caused by or resemble other medical conditions. Always consult a physician for a diagnosis. Symptoms may vary for each individual. Depending on your reaction to the bite you may have mild or severe symptoms. If you, or the person bitten, is experiencing more than mild pain or symptoms throughout your body seek treatment at the emergency department of a hospital. If symptoms are severe, or the person has trouble breathing, convulsions or cannot wake up, call 911 for immediate medical assistance and transportation to hospital. Early treatment is important, especially for young children and elderly people. A physician can evaluate the severity of the bite and give specific antivenin or treatment to relieve pain or respiratory problems if necessary. Persons with heart conditions or other health problems may require a hospital stay if bitten by a black widow spider. Try to collect the spider specimen in a small jar or plastic bag for examination by a spider expert, even if you have crushed it. Treatment in a medical facility may be necessary. How to identify a black widow spider? How can I keep black widow spiders out of my house and yard? Do female black widows kill and eat the male after they mate? Black Widow is considered the most venomous spider in North America. The venom of the black widow spider is 15 times as toxic as the venom of the prairie rattlesnake. 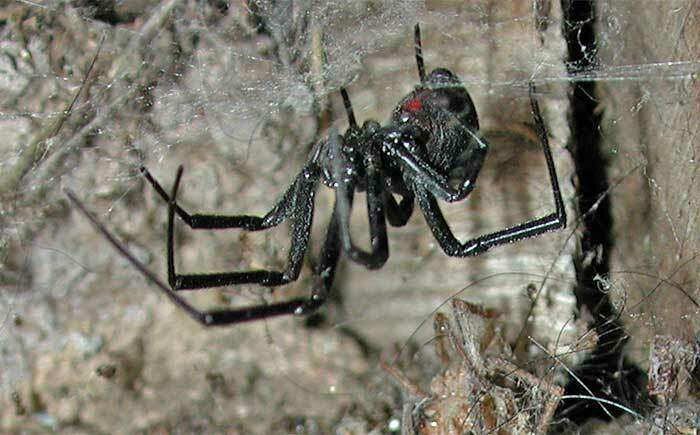 Only the female Black Widow is dangerous to humans; males and juveniles are harmless. More than 35,000 spider species of spiders occur in the World. About 3,400 species in 64 families are found in North America.